This fade-resistant, acid-free, 50 lb (74 gsm) art paper has a smooth matte finish color on one side, white on the other side. 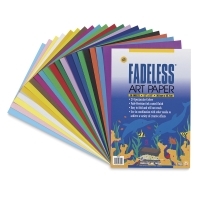 Fadeless Art Paper is excellent for paper sculpture, bulletin board work, signs, posters, and backgrounds. Fadeless Art Paper Rolls — Available in 24" (61 cm) and 48" (122 cm) widths, each roll is packed in a dispenser box. Fadeless Art Paper Pad — Available in a pad with 40 sheets, in 20 assorted colors. Assorted Sheets — Available in packages of 20 or 60 sheets, in 20 assorted colors. 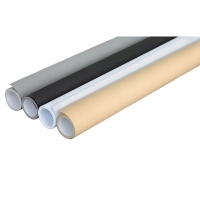 Assorted Neutrals — This set of four rolls includes Black, White, Pewter, and Tan. 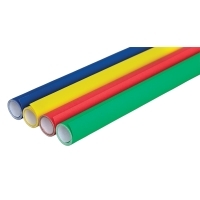 Assorted Primaries — This set of four rolls includes Flame, Royal Blue, Canary, and Apple Green. 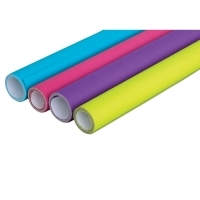 Assorted Brights — This set of four rolls includes Lime, Deep Purple, Magenta, and Azure.